For birds, migration is hard. Really hard. Many migratory species travel thousands of miles through all weather conditions with limited food resources. While many mysteries still remain around bird migration, scientists are learning more and more about the whys and hows of this incredible phenomenon. And it has a group of scientists in the Northeast asking: can we make migration a little easier for some songbirds by enhancing their favored habitats? In 2015, a collaborative project began between the U.S. Fish and Wildlife Service, the University of Massachusetts, and the U.S. Forest Service’s Northern Research Station. By collecting data on bird health and by tracking movements of migrating songbirds in the Connecticut River Valley, the team hopes to determine the best habitat types for certain migratory birds that stop over in the area. To gather this information, the team has been capturing woodland birds during spring and fall migrations using mist nets. Once captured, birds are banded and several measurements are taken including wing and beak size. Blood is drawn from some target species and brought back to a lab for analysis. The research team is getting a picture of the birds’ overall health by determining body composition (fat, lean mass, and water content), and instantaneous refueling rates which help determine if birds are gaining or losing mass during a stopover. Additionally, select birds are fitted with NanoTag transmitters which allow biologists to track the birds’ movements. NanoTags are tiny tags that emit a signal that can be tracked with telemetry equipment. Biologists can identify individual birds and their locations for months using the devices that are attached to the birds with a tiny elastic harness. Among the species targeted in this study are Swainson’s thrushes, northern waterthrushes, yellow-rumped warblers, Lincoln’s sparrows, and white-throated sparrows. 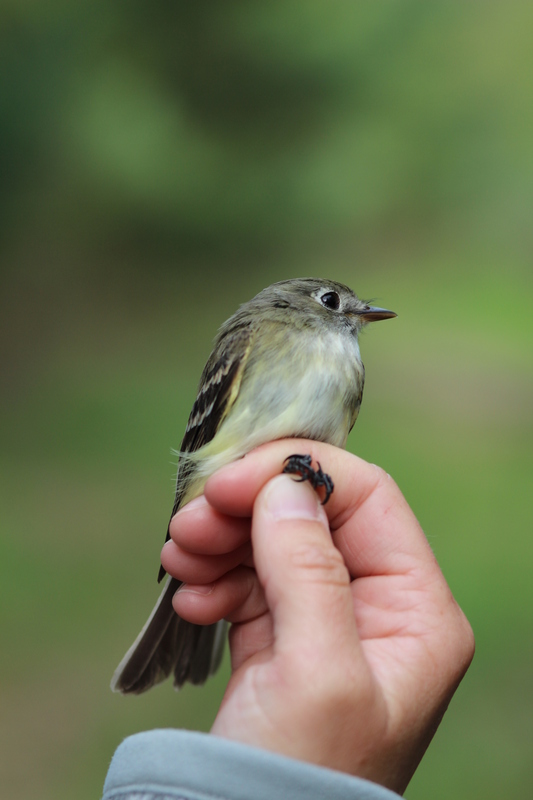 Data collection for this project wrapped up this spring; and over the past four years, biologists were able to band nearly 3,000 birds and fit over 200 target birds with NanoTag transmitters. This study has been taking place within the Silvio O. Conte National Wildlife Refuge. The Refuge encompasses an impressive 36,000 acres of the Connecticut River watershed in the states of New Hampshire, Vermont, Massachusetts, and Connecticut. The team has focused its capture and banding efforts on old-field sites within the Conte Refuge for this study, including the Fort River Trail area in Hadley, MA and the Orchard Hill section of the University of Massachusetts in Amherst, MA. Each site is less than 1/3 of a mile from the Connecticut River. U.S. Fish and Wildlife Service wildlife biologist, Troy Wilson, says, “We are interested in how physiological condition affects performance during the life stage of migration. Condition metrics – fat, lean mass, water – are used as indicators of the heath of birds, as well as a means to determine the quality of the habitats they occupy as they refuel from one location to the next.” The end goal is to determine how the Connecticut River Valley and the Silvio O. Conte National Fish and Wildlife Refuge can be a better host for migrating birds. The team hopes to be able to make recommendations for habitat management, specifically where forested areas should be converted to early successional habitat through forest management, and where old fields and shrublands might be managed for specific plant species and habitat structure that provide the highest benefits to birds during migration. 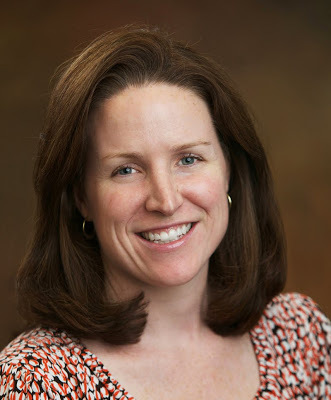 Jennifer Lynch Murphy is a wildlife biologist with C&S Engineers, specializing bird-aircraft collisions. She lives in Sunderland, MA with her husband, Kevin, and dog, Levi. This entry was posted in Blog entries, Habitat restoration, Migratory birds, Partnerships and tagged bird, Connecticut, Connecticut River, Hermit thrush, Massachusetts, migration, new hampshire, Silvio O. Conte National Fish and Wildlife Refuge, vermont on July 11, 2018 by usfwsnortheastblog. In this guest blog, Trout Unlimited’s Ron Rhodes and Rich Redman explain why U.S. Fish and Wildlife Service biologist Madeleine Lyttle was selected as the organization’s 2017 Conservation Professional of the Year. After Tropical Storm Irene dumped nearly 10 inches of rain on New England and the Northeast in 2011, the resulting flood damage was more severe than any in recent memory. Culverts, bridges, and roads were destroyed, causing a flurry of construction and emergency river channel work that often did more harm than good. If you had surveyed the damage in the weeks following the storm, you would never have envisioned that in the years ahead, more than 220 miles of native brook trout habitat would be reconnected, following the removal of more than 20 problematic dams and culverts that had prevented fish and aquatic organisms passage for decades. But Madeleine Lyttle, a fisheries biologist with the U.S. Fish and Wildlife Service’s Lake Champlain Fish and Wildlife Conservation Office, could see that future, and helped turn the tragedy into a triumph for conservation through her strong guidance and steady hand in the years that followed. Working hand in hand with Trout Unlimited (TU) chapters from New York, Vermont, and New Hampshire in the Lake Champlain, Hudson River, and Connecticut River watersheds, Madeleine cobbled together a complex array of partners, harnessed more than $1.5 million in grants from FEMA, U.S. Fish and Wildlife Service, the TU “Embrace A Stream” program, and other sources, and leveraged the power of TU’s grassroots network to identify, assess, plan, implement, and monitor aquatic habitat restoration projects. And so on September 29, TU Director of Volunteer Operations for the national organization, Jeffrey Yates, presented Madeleine with the 2017 National Conservation Professional Award. Thanks to her efforts, there is growing awareness of how removing and replacing dams and culverts is not only good for trout, salmon, and other fish, but is a real benefit to towns and counties in helping withstand future flood events. One of those communities benefiting from Madeleine’s passion and expertise is in Willsboro, New York, an hour east of the infamous Lake Placid and located on the Boquet River, about a mile upriver from Lake Champlain. The Boquet River was legendary for Atlantic salmon runs prior to 1864, until the Willsboro Dam was constructed to supply power for the Willsboro Pulp Mill. The area would later be identified as a superfund site because of all the discharge dumped into the river by the Mill. Eventually the site was cleaned up, with New York State Department of Environmental Conservation oversight. Then with Madeleine’s guidance, a suite of partners, including Vic Putman with Trout Unlimited, collaborated to have the obsolete dam removed and restore the region’s valuable fisheries. Countless dams and culverts across New England have come tumbling down, with fish returning to their historic waters thanks to Madeleine Lyttle’s years of work – “with lots more to come,” as Jeff noted at our annual meeting. Her technical expertise and guidance are often the difference between a project foundering or moving forward. She reluctantly takes credit, however, and is quick to remind everyone that the work can only be done with partnerships such as those between TU and the Service. This entry was posted in aquatic connectivity, Blog entries, Fisheries, Habitat restoration, Partnerships and tagged aquatic connectivity, culverts, dam removal, fisheries, habitat restoration, new hampshire, New York, partners, trout unlimited, vermont on November 28, 2017 by isaacburke94. Bass Fishing: A high school sport in New Hampshire? Today you are hearing from Gabe Gries, a fish biologist with the U.S. Fish and Wildlife Service, Division of Wildlife and Sport Fish Restoration, in Hadley, MA. Gabe has a Master Degree in Fisheries Biology from the University of Massachusetts (Amherst) and has also worked as a fisheries biologist for U.S.G.S. and the NH Fish and Game Department. In his spare time he enjoys fishing, cooking and writing articles for fishing magazines. What sounds like a dream for most kids (and adults) became reality in the spring of 2013 when New Hampshire became the third state to sanction fishing as a high school sport. Aligning with the New Hampshire Interscholastic Athletic Association’s (NHIAA) goal of providing sports with lifelong appeal that are coed and inclusive to all students, the enthusiasm and interest from students and parents for this new sport was overwhelming. There are currently 42 New Hampshire schools participating in bass fishing. Individual teams practice together and sometimes compete against other schools to hone their fishing skills before participating in the state qualifying tournament. The top 10 or 12 teams with the largest weight of bass caught during the qualifying event then move on to compete in the state finals tournament. The New Hampshire Fish and Game Department also offers annual educational seminars, giving students, parents, athletic directors and coaches a chance to learn about bass fishing techniques, tournament regulations, knot tying and bass life history and management. These seminars are well received and have been attended by hundreds of individuals so far. A bass fishing committee, made up of NHIAA staff, Athletic Directors and New Hampshire Fish and Game Department biologists, helps oversee the coordination, organization, and communication involved in making this sport possible. A state chapter of the Bass Anglers Sportsman Society (B.A.S.S. ), NH B.A.S.S. Nation, helps procure permits and runs the weigh-in at state tournaments. Numerous other anglers volunteer their time and resources as coaches and boat captains for the tournaments. Dingell-Johnson Sport Fish Restoration Grant funds, which are administered by the U.S. Fish and Wildlife Service and generated in part from a tax on sport fishing equipment and gas attributed to motorboats and small engines, help pay for the time of New Hampshire Fish and Game Department biologists involved in bass fishing as a high school sport. I am very excited about New Hampshire’s success and hope that other states follow their example and sanction fishing as a high school sport. Fishing allows students who might otherwise not participate in a high school sport to represent their school. It will also help students learn an enjoyment of the outdoors and an understanding of the aquatic environment, as well as patience, success, failure, and friendship. This entry was posted in Blog entries, Outdoor recreation, Youth and tagged Fish, fishing, high school, Lake Winnipesaukee, new hampshire, recreation, sport on July 5, 2017 by usfwsnortheastblog.